My family love crepes, and over the years I have made so many, that I no longer use a recipe when I make them. Thousands of crepes later I can now say my crepes are thin, soft and delicious. 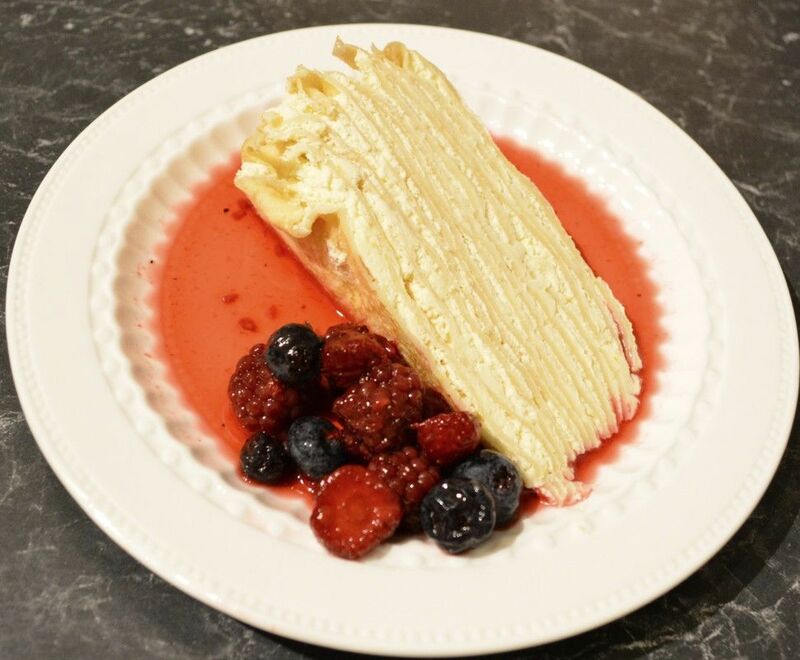 This recipe I have been making for years, I love crepe cakes. I love changing the fillings and getting new cakes each time. I have made lemon curd filled ones, chocolate filled ones and chocolate and fresh fruit filled ones, now it was time for a citrus cream cheese version. 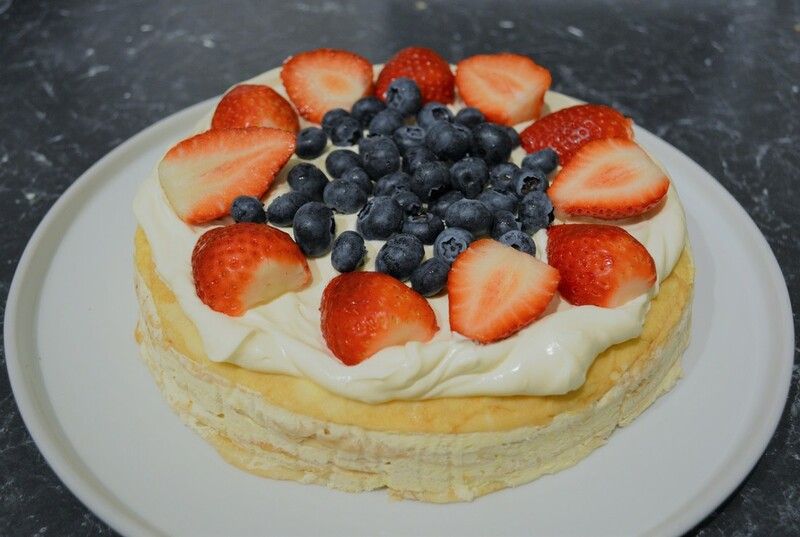 This cake is light and creamy and the berry salad finishes it off to make it one very delicious cake. After you have made the crepes, the rest of the recipe is super easy. It is a cake you can make the day before, so it's great if you are having a party, as you can make it in advance. Now for the crepes, below is the recipe I used when I first started making crepes. I double this recipe, I even triple this recipe when needed. I have made it with full cream milk, skim milk or a combination of milk and mineral water, all depends on what I have in the refrigerator on the day I'm making crepes. The consistency needs to be like pouring cream. If you fry the crepes and you get a lot of holes in it, you need more flour, if it spreads to slow, it needs more liquid. This is something that comes with practice, but after you have made a crepes a few times, you'll get it. ​Mineral water, adds extra lightness to crepes, I use it if I have it at home. 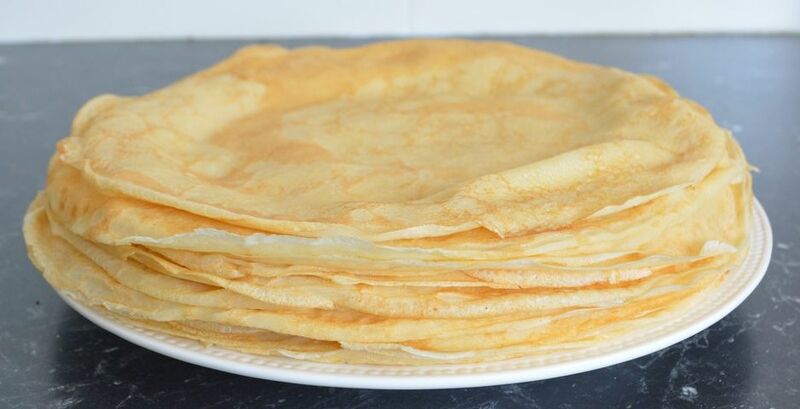 You will make more crepes than you need, but just use leftover crepes for breakfast or as a snack filled with jam, nutella or freshly squeezed lemon juice and caster sugar. The crepe pan needs to be hot, quite often the first one is just a tester. I fry them over a medium heat, I don't like burnt crepes. For an extensive look at how I make crepes and more tips, click here, it will lead you to my crepe page. The berry salad is great on ice cream, so much better than store bought toppings. I make the cake in a springform tin, just smaller than the crepes, if you don't have a springform tin, don't fret, you can just make it directly on a plate, it still looks fabulous and the flavours are obviously the same. This is delicious, looks amazing, tastes amazing and is something you need to try. Make the crepes: In a bowl whisk the eggs and the salt, then, alternating, slowly add the flour, milk and water. Whisk well until there are no more lumps of flour. Let the mixture sit for 30 minutes. Heat a crepe pan, spray or brush with oil, using a ladle pour batter into the top side of the pan, swirl quickly around pan to just cover the base of the pan. When the bottom side has browned and has loosened from pan, flip the crepe over and let brown. 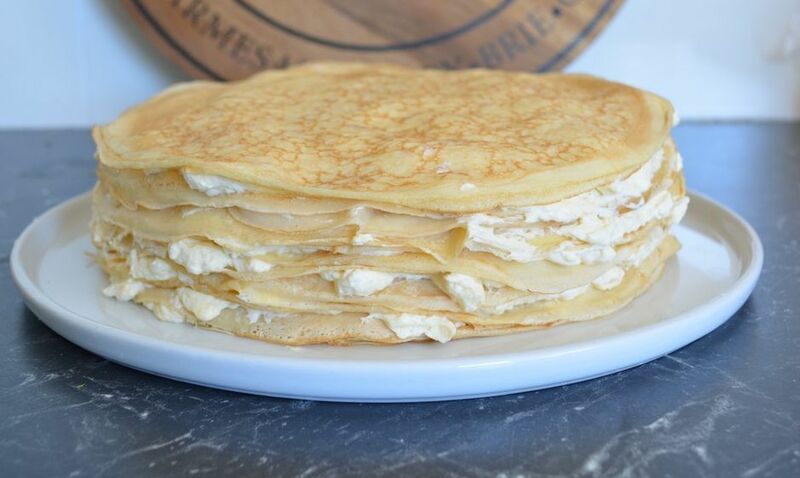 Stack crepes on a plate. Repeat with remaining batter. Allow to cool completely. Make the Berry Salad: Combine berries, sugar and juice in a bowl. 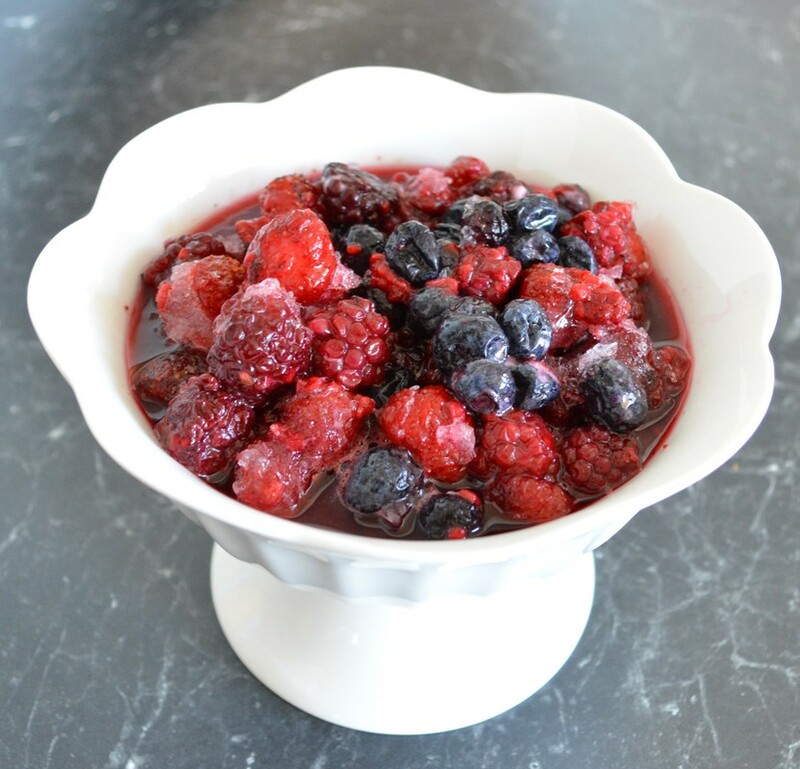 Stand at room temperature for 30 minutes or until sugar dissolves and berries have thawed. You can keep it refrigerated, if making it in advance. Sprinkle with mint before serving. ​Make the filling: Using an electric mixer, beat cream and extract in a small bowl until soft peaks form. Using an electric mixer, beat cream cheese, sugar and zest in a medium bowl until smooth. Beat in juice. Fold in whipped cream. To assemble: Place 1 crepe on a serving plate or in a baking paper lined springform tin. Spread with 1/3-1/2 cup cream mixture (depends on size of crepes, may even be more). Top with another crepe. Repeat layers, using remaining crepes and cream mixture, finishing with a crepe. Cover; chill for at least 4 hours. ​Just before serving, (if using a springform tin, remove sides and paper and invert cake onto your serving plate), then place extra whipped cream in a mixing bowl, beat until just thick enough to spread. Spread on to the crepe cake. 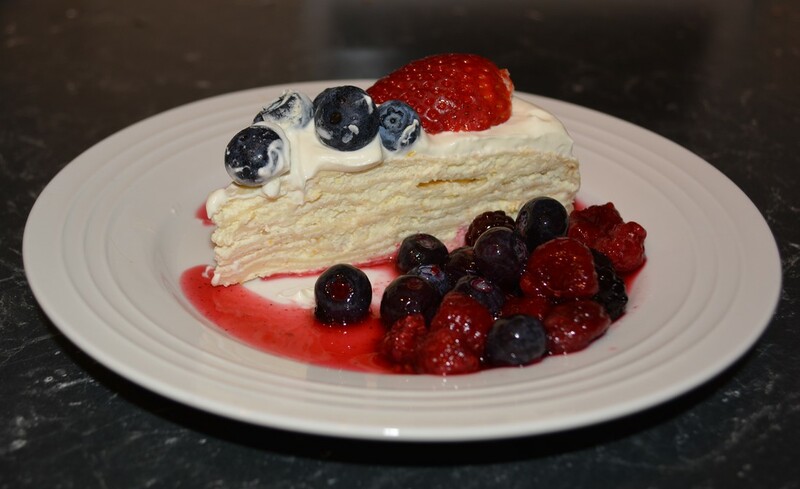 Place on some fresh fruit, sprinkle crepe cake with almonds; lightly dust with icing sugar. Serve with berry salad.